News buttons are available to promote the directory on your website, blog, and social media. New! Graphics and Buttons for your website, newsletters, and social media networks are here. A new directory on the California Courts online self-help center provides a comprehensive set of links to information and resources for immigrants who must access the legal system. Chief Justice Tani Cantil-Sakauye announced the formation of the California Immigration Information Resource Workgroup on February 1, and directed it to aggregate existing immigration resources and make them easily accessible. 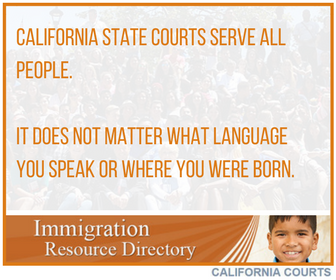 The online directory is part of the California Courts self-help center, which is also available in Spanish. Immigrants who speak other languages will be able to access the site using Google Translate. The graphics below appear smaller than their true size. Double-click to save.